A shimmering orchestra of crystallized guitar collage dedicated to the discovery that even the mysterious and resented can be beautiful when memory is slowed down. Intended as a standalone piece, "Waypoint" freezes the ephemeral moment of realization as it dawns and abruptly divides on itself. This single composition is split in two complementary halves for separate reflections on both the arrival and departure from personal junctures and finally overcoming the questioning of one's trajectory to the present. 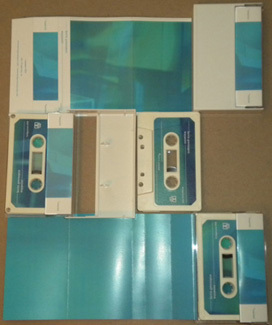 First edition of 130 cream chrome cassettes dubbed in real-time with full-color labels and doublesided printing on heavyweight gloss stock. Second edition of 115 clear cassettes.